Elizabeth Lindsay was the daughter of John and Elizabeth Muir. John, her father, was a coal miner who was born in Carluke, Lanarkshire, Scotland. Elizabeth's mother, also an Elizabeth, was a tailor in Scotland who was born in Dalserf. Elizabeth Lindsay lost two brothers in WW 1: Frank Muir, an Able Seaman was killed on Monday November 13, 1916; Louis Mccutcheon Muir, Private 8th Bn. Gordon Highlanders, died Saturday October 9, 1915. 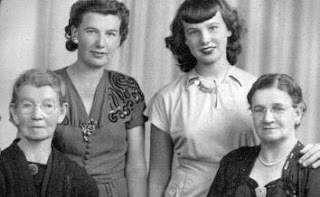 Following the war, her third brother and last sibling, Hugh Muir, emmigrated to Australia in 1922 never to be seen by her, or his family, again. Elizabeth Lindsay was married to David Lindsay and they led a very comfortable life in Motherwell, Scotland. David worked with his father in the tubeworks and had such a wonderful singing voice, he could have turned professional, had there been the opportunity. 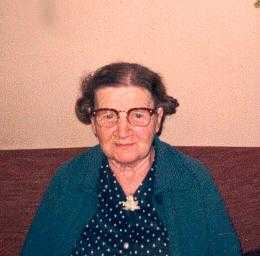 Elizabeth was a talented knitter and sewer who assisted her mother as a tailor. Together Elizabeth and David were the parents of Betty, David, Isabel, Annie, Stuart, George and John. Adding to the many losses Elizabeth was to suffer in her life, her children George and Anne died shortly after birth. A determined but sensitive and shy woman with a flair for poetry, Elizabeth had no desire to leave Scotland when her husband, David, decided to follow in his sister and brother-in-law's footsteps and move the family to America in 1922 to seek an even better fortune. This was the same year her brother Hugh left for Australia to seek his own fate. Leaving her parents and homeland for the "New World" was a sad adventure for Elizabeth, the loss of her brothers and children already lying heavily upon her. Unfortunately the financial success story that was Canada during the Roaring Twenties, all too soon gave way to the Great Depression and the job David had been promised in Toronto failed to materialize. He did manage to find work with the Canadian Pacific Railway and then moved to their flagship hotel, The Royal York in Toronto. With a large family to support and struggling, along with the rest of the world, to make ends meet, Elizabeth also took work at the Royal York, on the cleaning staff. In Canada, Elizabeth and David added Robert (Bob) and James to their family. However, their standard of living in Canada was hard and radically lower than it had ever been in Scotland. Elizabeth's parents visited briefly on their way from Scotland on an ill-fated journey to find their son Hugh in Australia. Her parents made it to Australia but were never able to locate their missing son; and Elizabeth's father, John Muir, tragically died and was buried there in 1932. Alan Appleby has since discovered that Elizabeth's brother, Hugh, was captured by the Japanese on on the Island of Nauru in 1940 and likely died a prisoner of war. Although devastated by these tragic losses, Elizabeth and David, had to travel to Australia themselves, to bring Elizabeth's mother home with them to Canada. Then, Elizabeth Muir herself passed away in 1948. Elizabeth Lindsay's husband David died in 1953 and Elizabeth was left to struggle along on her own, with the support of her children. She became withdrawn and depressed, retreating deeper into her self during the last years of her long life. Her shy and gentle wit, revealed itself less frequently. Elizabeth had always expressed herself in poetry, which she wrote whenever and wherever the opportunity arose. She died in Toronto, in 1975, and is buried with her husband in the grave next to her mother at Pine Hills Cemetary in Scarborough.